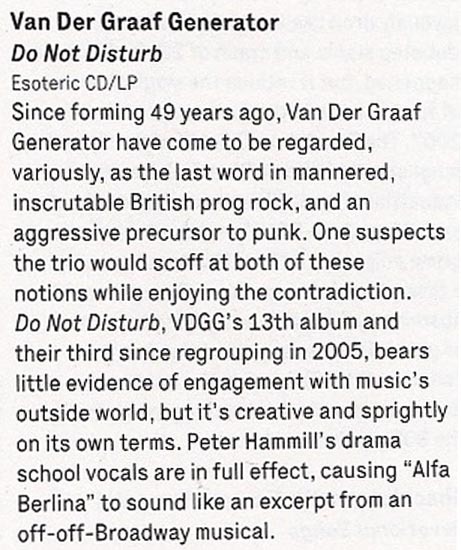 Do Not Disturb was released on 30th September 2016. Do Not Disturb Do Not Disturb is also available on Vinyl. 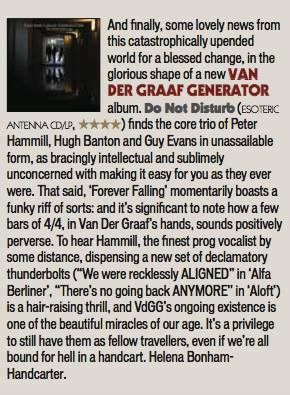 There's a discernible upward trajectory to the main Van der Graaf Generator releases since their '05 reformation. Present was the "they're back!!!" album which was pretty solid and received unanimous acclaim in the press, but any minor shortcomings were probably overlooked because it was thrilling to live in a world where "they're back!!!" Trisector was the debut of the trio (Jaxon having split at the end of '05) and further confirmation that 21st Century VdGG was in no danger of tarnishing the vaunted legacy but would instead add to it, quite exquisitely. Yet, for the great songwriting and performances, there was a feeling that the trio was gaining its footing and that a classic was just within its reach. 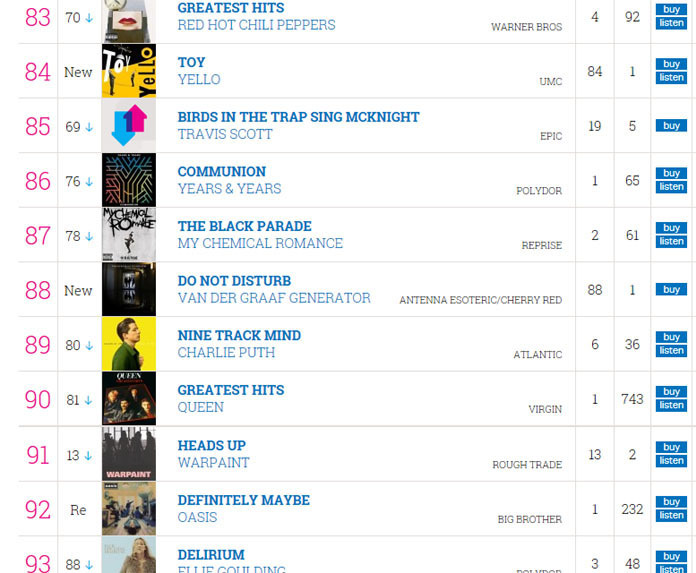 That promised potential was realized with A Grounding In Numbers, a tremendously strong album with real bite and one that, to my mind, can stand proudly and rightly with any of the much-loved 70s output. Which brings us to Do Not Disturb. 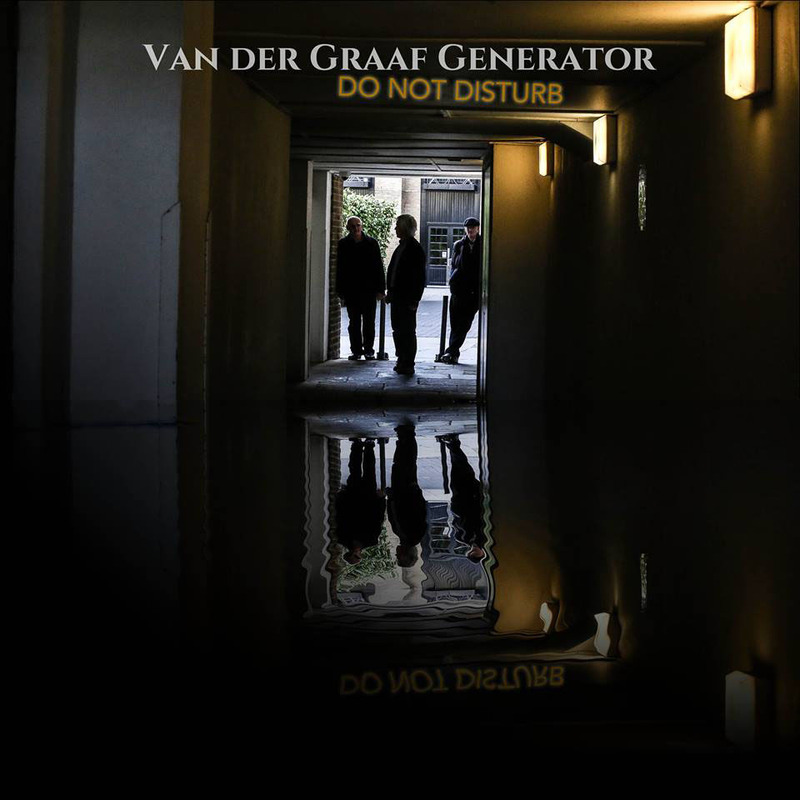 Incredibly, the new (and possibly final) offering from Van der Graaf Generator is the best thing they've done since their reformation. In a career that has origins dating back almost fifty years, this album feels like the culmination of their noble journey, as if this was meant to be the closer. 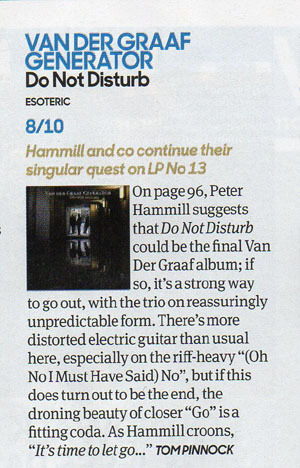 As such, Do Not Disturb sometimes recalls past glories yet sounds new, groundbreaking, and unlike anything else they've done. I hope loads of newbies come across it because at least some of them (the ones that don't run screaming from the room, as ever) will have a "Where have they been all my life" moment and work their way backward, and good for them. As for long time fans, they will not be disappointed although they may be caught off guard and challenged. 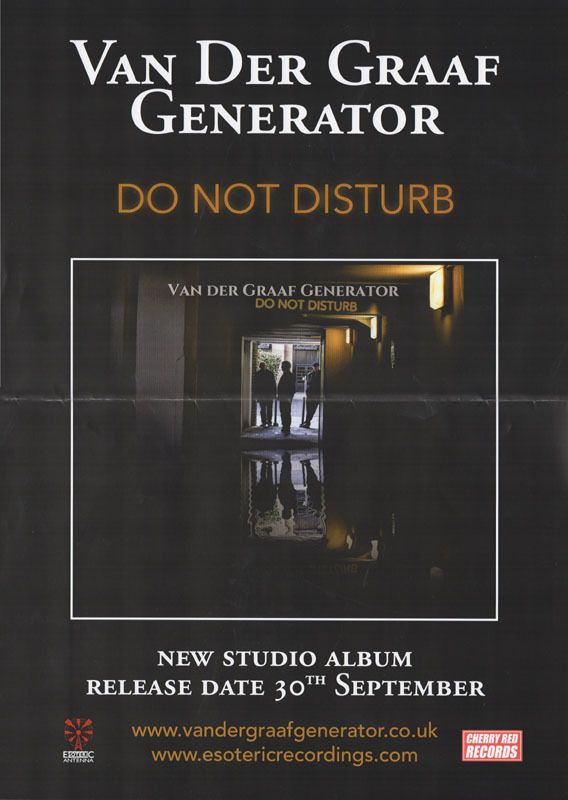 Van der Graaf Generator have not stated that this will be the last album, and there certainly may be further releases. 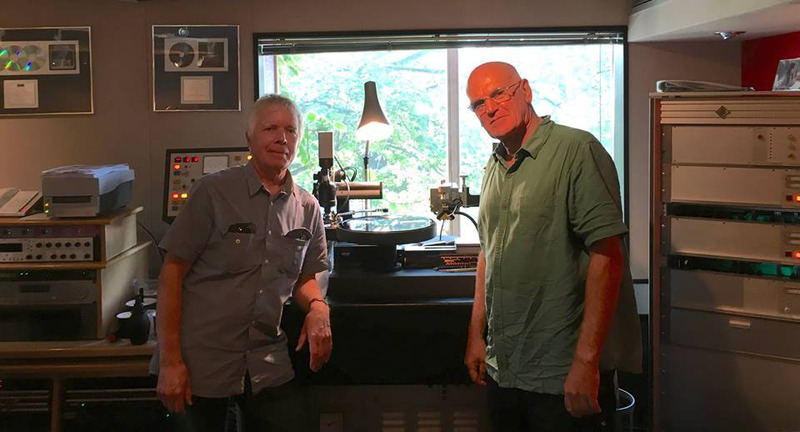 However, given their age (all members in their mid-Sixties), they are aware that it could be the last VdGG release and that thought was stated and swirling about as they made the record. Perhaps because of this, there is more stylistic variance on this disc than on any other VdGG release (and that includes World Record with its reggae and flamenco flourishes...). 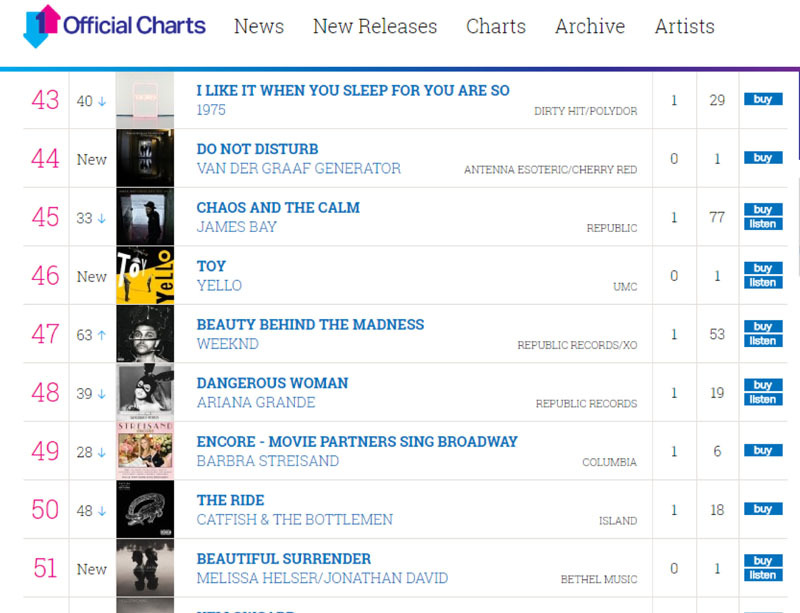 Actually, there is probably more variance in any one song on this album than there is on any previous disc. That's obviously a bit of an exaggeration but, seriously, just when you think you have a grip on where it's all going, it twists into a completely unpredictable direction, often several times within the same song. The risk is that this approach can leave the unprepared so befuddled that accusations of throwing in everything and the kitchen sink may arise. But there is, paradoxically, a twisted cohesion to the proceedings thanks to VdGG's expert execution. They make it work. And it's fantastic. The album opens with "Aloft". Its breezy guitar, gentle vocals, and the delicate cymbal work of Guy Evans evoke the opening tune of AGIN, "Your Time Starts Now". Not for long, however, as the song shifts to a jabbing, organ-led workout which morphs yet again into a powerful, heavy electric guitar romp, and back again. A real belter of an opener, revealing textures hitherto unheard on any past offerings as accordion is added to the VdGG palette. In the capable hands of Hugh Banton, that's a major plus point (think Astor Piazzolla, not "Roll Out The Barrel"). There are odd time signatures and some complicated playing but the band make it sound smooth and effortless. Then it's back to Italy, 1972, and VdGG being driven around by promoter Maurizio Salvadori in his "Alfa Berlina". In a reference to that era, the song starts out with a somewhat avant-garde sound collage containing audience applause (presumably from an Italian audience), sirens, and street traffic before launching into a driving 4/4 number with an infectious chorus. This tune could almost be a hit, so catchy is it, although I don't know how radio would feel about the soundscape sections (I love 'em). "Room 1210" is, lyrically, about the solace one takes in the sanctuary of a hotel room, which is certainly a welcome respite from the chaos surrounding touring musicians much of the time. Guy's light touch on the cymbals and HB's accordion work stand out. Similar to "Almost The Words" and "Brought To Book", it's a piano-based song which affirms that, while the band may be known as merchants of hair-raising chaos, they are also expertly capable of delivering up wistful moments of beauty. In the case of the latter two songs, it's some of the most accessibly elegant music they've ever produced. All three numbers share another similarity, which is that they all go off into completely different directions after a seemingly unshakable, tranquil mood is set. And I mean seriously different directions. And they're album highlights in my book. In "Almost The Words", the wistful piano section gives way to a glorious rock workout which gives Banton the opportunity to demolish his gear with a blistering solo. It's reminiscent in style and tone of his solo spot in "Octopus" from the late 60s debut album Aerosol Grey Machine. Great stuff! In the case of "Brought To Book", I honestly can't even describe what I heard. Really. The beauteous piano music just stops and goes into this absurdist Dada-like jam that is probably the biggest "WTF just happened???" moment on any VdGG album, ever. It's AWESOME! Just about every tune is a standout. "Shikata Ga Nai" is ethereal, evocative, moody... it could well be Banton's modern take on "Pictures / Lighthouse" from Pawn Hearts, except on accordion. At the same time, there's nothing like it in the VdGG catalog and it's stunning. The rockers this time around are "Forever Falling" and "(Oh No, I Must Have Said) Yes". The former starts out like "The Hurley Burley" (with lyrics) before giving way to an off-time signature groove complete with electric guitar, stabbing organ chords, and tasteful percussion (shakers and the like) augmenting Guy's flawless drumming. "(Oh No, I Must Have Said) Yes" starts like a studio version of something from the live album Vital (1978). Think about hearing "Ship of Fools" or "Door" from that album, and then discovering their studio counterparts. This song sounds like a studio counterpart for a song that could have been on that classic live disc. That is until it morphs into a fun jazzy interlude. 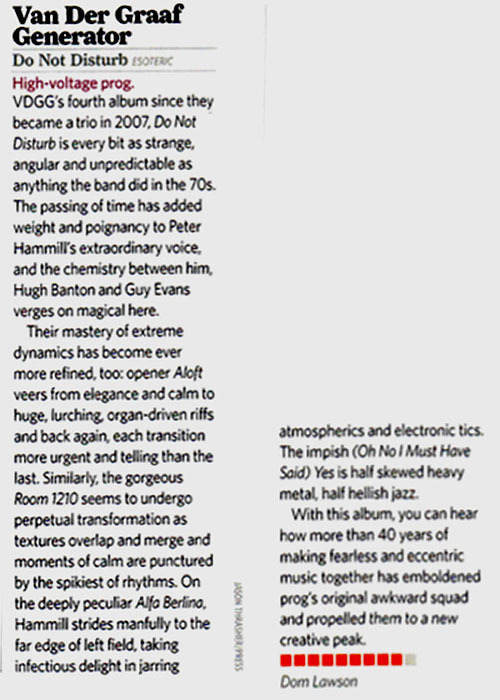 Banton walks the bass, Evans effortlessly corresponds with his trademark jazz stylings, and Hammill delivers the goods with some off-the-wall guitar, complete with very competent and creative whammy bar usage. As it is on the the rest of the album, his guitar playing is perfect for the music. "Go" ends the disc on a sombre note and could well be interpreted as the coda to not only the album, but the career if this is indeed the last go 'round. I was really knocked off my feet by this album. It's amazing that they can sound so fresh, so young even, at this point in their career. There's no less fire or edge now than there was when they made The Least... forty seven years ago. And they're taking even more chances. I know that there is talk of this possibly being the final chapter, but if we could get a guarantee that future releases will be this good then I'd like them to carry on into their 90s. Hope I die before I get old? Nah. Not if you're still this worthwhile. 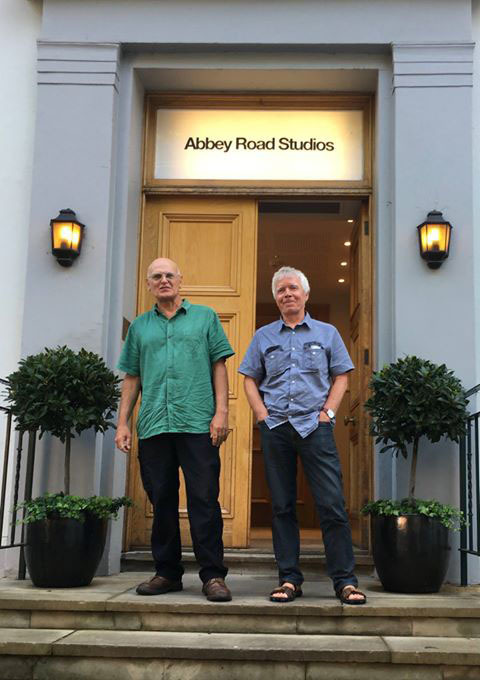 Abbey Road Studios June 8th - Hugh and Guy present for the vinyl cut of Do Not Disturb. July 2013. The tour that brought Van der Graaf Generator around Europe draws to a close with the three Italian dates of Udine, Milan and Pistoia. 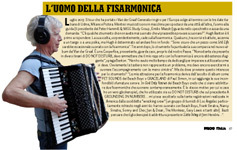 While the musicians are in the car moving from city to city, the guide (the president of the Peter Hammill & VdGG Study Group, Emilio Maestri) looks in the mirror and asks a question: "Is there any instrument that you have never played that you would like to try playing?". Hugh Banton is the first to respond. His choice, surprisingly, falls on the accordion. Someone, between smiles and jokes, mentions a tango or a polka, but Hugh is determined to go all the way: "I am sure that a piece like Still Life would be exceptional played with the accordion." 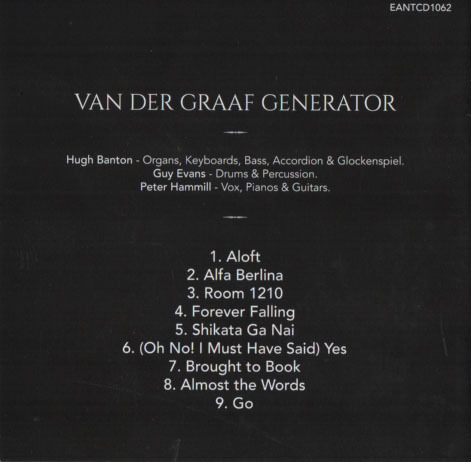 Three years later, it makes a timely appearance on the new Van der Graaf album. It is a Cooperfisa, coming, as it happens, right from our country (Italy). "Although it appears in several passages on DO NOT DISTURB, I must admit that my relationship with the accordion is still quite elusive." Banton said. "I did not have much time to learn how to use it. Of course, the keyboard is not a problem, but I still had to practice the bass part with the left hand. "But where does this interest for the instrument come from? 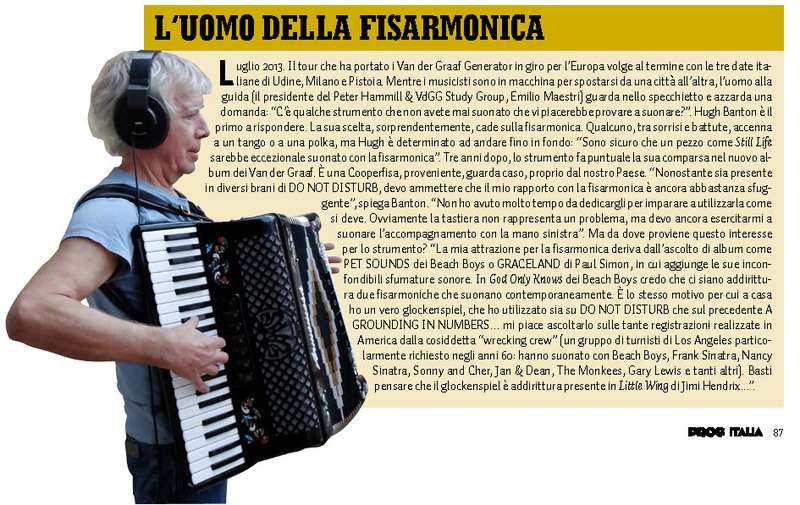 "My attraction for the accordion comes from listening to albums like PET SOUNDS by the Beach Boys or GRACELAND by Paul Simon, in which he adds his unmistakable sound nuances. In "God Only Knows" by the Beach Boys, I think there are even two accordions playing at once. It's the same reason why at home I have a real glockenspiel, I've used both on DO NOT DISTURB, more than on the previous A GROUNDING IN NUMBERS... I like to hear the many recordings made in America by the so-called "wrecking crew" (a group of LA session aces particularly requested in the 60s: they played with the Beach Boys, Frank Sinatra, Nancy Sinatra, Sonny and Cher, Jan and Dean, The Monkees, Gary Lewis and many others). I think that the glockenspiel is even present in "Little Wing" by Jimi Hendrix...".